Melanomas, also known as malignant melanomas, are cancers of pigment cells (melanocytes) in the skin. They can spread early, which is why they are the most dangerous of the common skin cancers. Melanomas can be fatal if not detected and treated before they have a chance to spread. Australia has the highest incidence of melanoma in the world. Melanoma incidence increases with age, however it is the most common cancer in young Australians aged 15-39. The biggest risk factor for the development of melanomas is exposure to the sun - in particular intermittent sun exposure that leads to severe sunburn. Sunburn in childhood is an especially important risk factor, however sunburn in adulthood also plays a part. Melanomas are more common in areas that have been sunburnt in the past. People with lighter skin are more prone, as are people with occupational exposure to the sun (eg builders). A family history of melanoma is important, especially in first degree relatives (parents, siblings). A third of melanomas start in a mole, whereas most appear from apparently normal skin. People with multiple irregular moles (dysplastic nevus syndrome) are at an increased risk and need close monitoring. Melanomas are cancers of pigment cells, and most show signs of pigmentation. They often display various shades of brown and black. Pigmentation in the deeper layers of the skin is bluish in appearance. 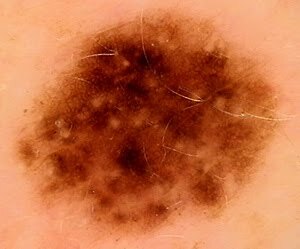 Sometimes melanomas have areas showing a hazy or veil-like appearance where the immune system is attacking, or patchy areas of no pigmentation where the immune system has attacked. The color variation is irregular and asymmetrical. 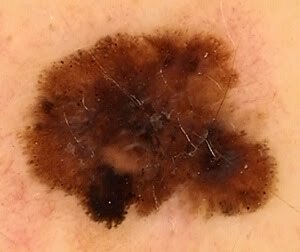 Some melanomas display minimal pigmentation - the amelanotic melanoma. Melanomas can be flat (superficial spreading melanomas) or raised (nodular melanomas). Sometimes melanomas can appear quite innocent, and the only clue of malignancy is that they change in appearance over a period of a few months. E - for evolving ie changing. Normal moles change slowly over years, however moles that change over a period of a few weeks or a few months need close attention. The most important of these features are change, color variation and asymmetry. Moles that show one or more of these features (eg asymmetry) should be assessed by an experienced doctor. These irregular moles need to be checked with a dermatoscope (see Fig.3), and are examined for signs or clues of malignancy. Suspicious moles need to be removed and tested by a pathology lab. 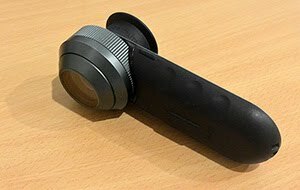 If a mole is irregular but not suspicious, a digital photo can be taken to assess future changes. 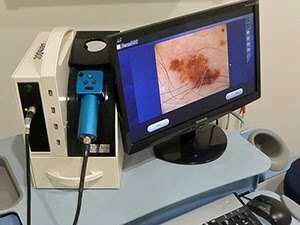 Melanomas are treated with surgical excision. A wide margin of normal skin around the melanoma is also removed to lessen the risk of recurrence. The excised tissue is examined by a pathologist with a microscope to ensure no abnormal cells are close to the edge or bottom of the specimen. Sometimes nearby lymph nodes are removed to assess any local spread. The prognosis of a melanoma is largely dependant of how deeply into the skin it has invaded. Level 1 melanomas have not yet started to invade and are extremely unlikely to cause further problems. Melanomas that have invaded less than 1mm are unlikely to cause further problems. It is common for patients to confuse the terminology of levels and stages. A level IV melanoma is one that has penetrated to the deeper layers of the dermis. A stage IV melanoma is one that has spread to internal organs or to other distant parts of the body. When patients are diagnosed with a level IV melanoma, they are usually at stage I or II (hasn't spread to local lymph nodes). However, when they look up the internet etc, they are often reading about stage IV melanomas and become more alarmed than they should. Fig 1. Melanoma showing asymmetry and color variation. Fig 2. Melanoma showing asymmetry, an irregular border and color variation.